Autumn-lovers rejoice as the temperatures drop, the leaves change colors, and we can swap shorts for jeans. Autumn in New England celebrates the changing seasons in one of the most beautiful parts of the country. This rich, autumnal kit combines the reds, golden yellows, and browns of the changing leaves with neutral grays, tans, and creams for scrapping timeless memories. Featured elements include lighthouses, lobsters, ephemera, covered bridges, and changing leaves galore. Autumn in New England also comes with a weathered wood alpha and matching wooden sign word strips for labeling your pages in style. Grab a warm beverage and scrap your favorite fall photos with Autumn in New England. Ponytails Designs just released a new template pack for the Buffet at GingerScraps. Grab Walk the Line Volume 1 now while it's just $2. 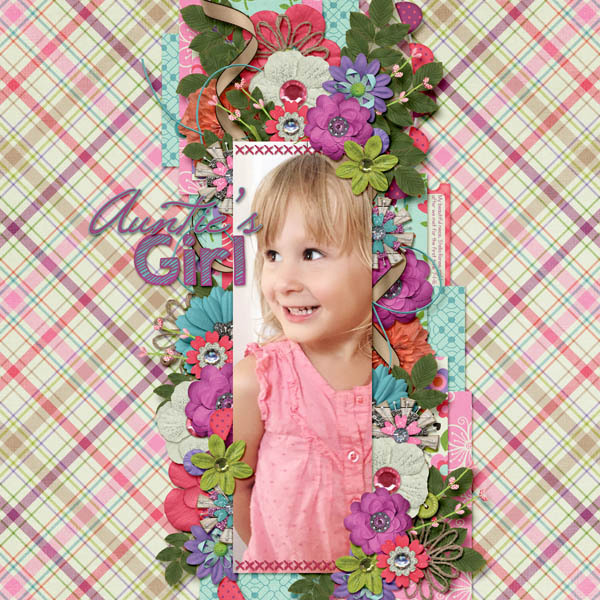 I used her Girly Girl kit to create a layout of my beautiful niece!